We hosted a one-off event entitled History on Screen on Wednesday 19 September, 2018, following a successful application for College of Arts’ Graduate School funding. The intention was to explore how history is presented to audiences through the medium of film and television. However, in doing so, we also promoted a stronger community ethos within the College of Arts. Originally we intended to screen the historical epic, Braveheart (running time 3 hours 2 mins), but on reflection we thought that some shorter and lighter entertainment might work better. 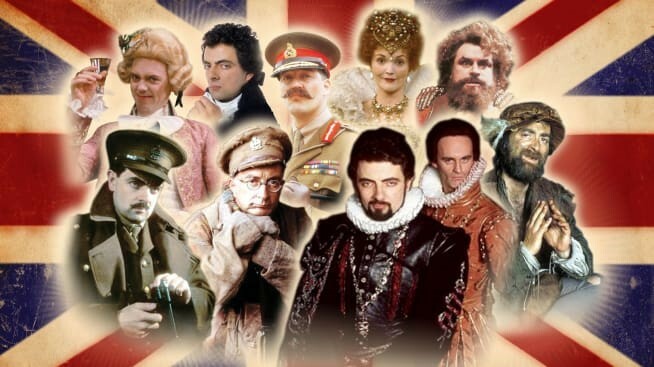 , In the end, it was decided that we would screen four episodes of the historically-themed comedy, Blackadder, with one episode from each of the four seasons representing a distinct period in history. 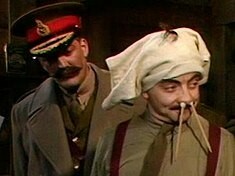 Blackadder offers a humorous portrayal of history: mixing fact with modern commentaries, and the pantomime-like use of costume, stage-setting and dialogue. Together, these features allowed for plenty of discussion points, which were well-exploited by our audience. To aid discussion, we also produced handouts for the participants, offering a synopsis of each episode (see below) and possible discussion points. Attendance of the event was affected by its coincidence with Storm Ali, which had led to road closures and Met Office advice to avoid venturing outdoors. However, those individuals who braved the elements, proved to be an engaged and enthusiastic group, giving excellent contributions and thoughts on how history is presented through the medium of television. The episode ‘Beer’ prompted some interesting thoughts on the presentation of powerful women. Both ‘Beer’ and ‘Corporal Punishment’ sparked a lively discussion about the ‘lad culture’ of the 1990s. This informed the images of masculinity in these episodes and their relevance to the current debate on ‘toxic’ masculinity. The link between costume and characterisation, and the importance of good design and writing, was also discussed – reflecting the value of contributions from multiple disciplines within the College of Arts. Our audience included students from Creative Writing and History as well as Film & TV. We also had interest from Archaeology and English Literature Students. This interdisciplinary group provided no only a greater sense of community, but allowed us to view the discussion from different perspectives. We now want to use this event as a launching point for a longer-term project, as it has shown that not only does the potential for further events of a similar nature exist, but also that creating a university society that discusses the depiction of history through film would be welcomed! In our application for funding, we had signalled the possibility of using this event as a launching point for a longer-term project, perhaps culminating in the creation of a university society that focusses on the depiction of history through film. The purpose of History on Screen was to promote a greater sense of community within the College of Arts and this event has shown that not only does the potential for further events of a similar nature exist, but that creating a university society that discusses the depiction of history through film would be welcomed.